Our NEW Joyful Jerky for dogs start with cage-free chicken breasts or ranch-raised beef rounds, which are thinly sliced, and then air-dried to savory perfection. 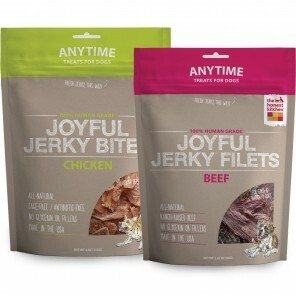 They're a delicious way to show your dogs how much you love them during snack time, or anytime really. Ingredients: Beef, Salt, Celery Juice Powder. Ingredients: Chicken, Salt, Celery Juice Powder.